Inspired by Mathaf Gallery’s unique archives, Mathaf Studio has created unique, limited edition silk shawls of the highest quality. These celebrate scenes and traditions of the Middle East, some of which have disappeared forever. From vignettes of daily life such as The Watercarrier to moments of calm reflection as in Oasis at Evening Light, each shawl has been described as a work of art in itself and a collector’s item of the future. On one side the scarves feature details from 19th Century Orientalist paintings by Robert George Talbot Kelly, Augustus Osborne Lamplough, John Alexander Harington Bird, Eugene Fromentin, Charles Theodore Frere amongst others; on the reverse geometric Islamic patterns – mostly drawn from architectural features within paintings. Made from 100% silk satin and hand made in the United Kingdom, each scarf is gift wrapped and accompanied by a numbered certificate. 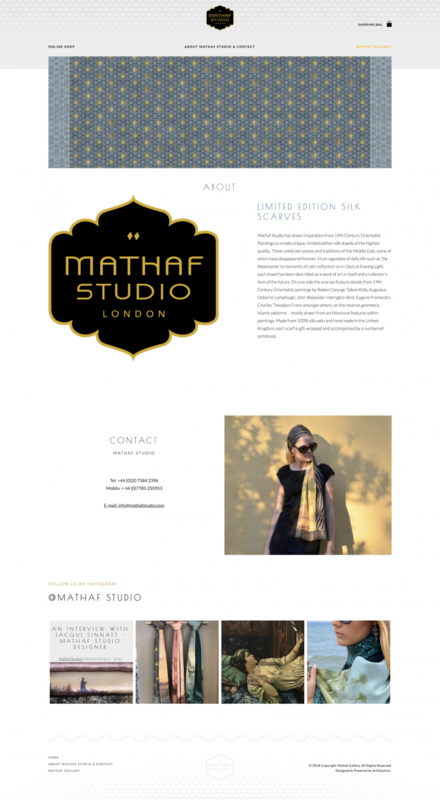 Mathaf Studio’s website was designed and created by ArtSolution.